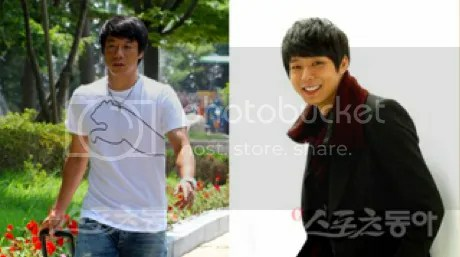 [TRANS] 110329 WHICH KOREAN WORLD CUP SOCCER PLAYER RESEMBLES PARK YOOCHUN? Who is the Korean World Cup soccer player that looks like Park Yoochun? The findings of similarities between Korean celebrities and World Cup soccer player attracted a lot of attention from netizens. In the morning of the 29th, an online picture hosting site released pictures of singers and soccer players that simply look similar but have no relations with each other, regardless of gender and age. The pictures of JYJ’s Park Yoochun (25) and Korean World Cup soccer player Ki Hoon Yeom (28) were very similar, thus attracted the attention of netizens. 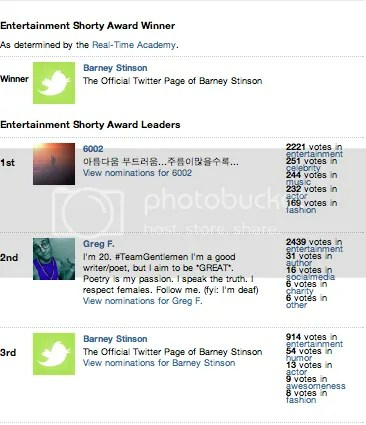 Korean celebrities exhibit their social media power yet again through the recently concluded “3rd Annual Shorty Awards”. Hailed as the “Oscars of Twitter”, the “Shorty Awards” recognizes people and organizations who are producing the best “short-form, real-time social media content”. Nominations were made through Twitter while winners were determined using a combination of popular vote and deliberations by the members of the Real-Time Academy of Short Form Arts & Sciences. Several Korean celebrities won accolades for their use of Twitter. The biggest winner is JYJ’s Kim Jaejoong who won the “Celebrity” category beating out Canadian superstar Justin Bieber and Super Junior’s Heechul. 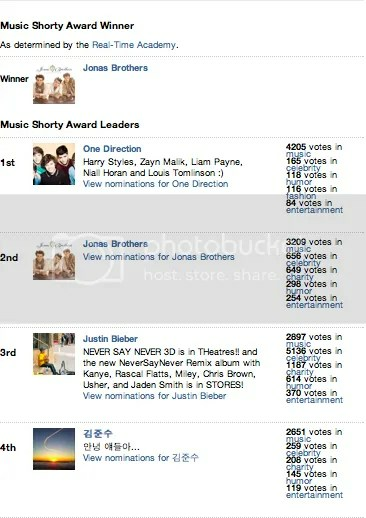 Other Korean stars were nominated for this category including Jay Park (6th), JYJ’s Yoochun (10th), JYJ’s Junsu (11th), and Super Junior’s Leeteuk (24th), Eunhyuk (39th), and Donghae (47th). 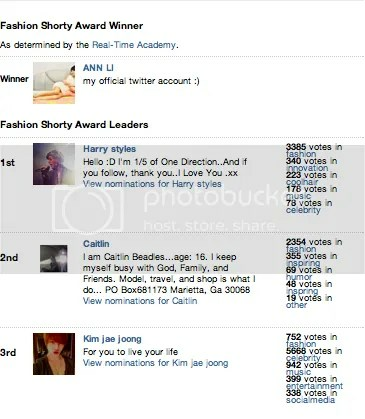 In the “Actor” category, the boys of JYJ including Yoochun (9th), Jaejoong (12th), and Junsu (26th) exhibited their Twitter popularity once again by ranking higher than other Korean celebrities including worldwide superstar Rain (50th), Donghae (28th) and Heechul (29th). Korean stars also figured well in categories such as “Music”, “Entertainment”, and “Fashion”. 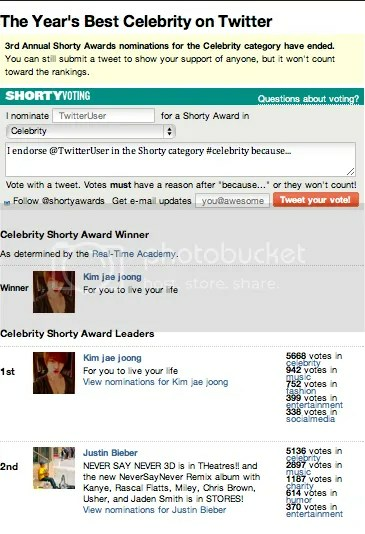 Congratulations to all the Korean celebrities who have used Twitter well. To see the complete list of categories, nominees and winners, visit the Shorty Awards website. [TRANS] 110329 JYJ YOOCHUN & TVXQ YUNHO ARE NEIGHBORS? Recently, an online forum displayed a picture of JYJ member Park Yoochun and TVXQ member U-Know Yunho standing side by side, attracting a lot of attention. 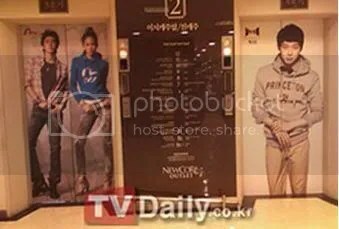 The photo shows the respective singers’ clothing endorsement advertisements fitted according to the elevator doors. The two blown up ads standing in line with only a wall as a barrier created a very interesting atmosphere for people walking by. Marrying young and divorcing young! That’s the kind of ex husband and wife that is portrayed in this romantic comedy “Paradise Ranch”. Changmin from Dong Bang Shin Gi and Lee Yeon Hee from who is from the same entertainment company are the two that brought this fiery drama to life. Changmin: Being an actor for the first time, there was a lot of pressure and I was quite nervous and a little bit worried. But thanks to Lee Yeon Hee and to the staff, I was able to enjoy the six months that we spent filming. Filming for this drama also occurred in Korea’s famous island, Jeju Island. Lee Yeon Hee: The amount of lines that Changmin and I had in this drama were actually quite high, so it was a bit hectic. But thanks to the filming taking place in Jeju Island where the air was so fresh, I think I was able to naturally express my feelings while acting. Changmin: The Songak mountain I saw while it was snowing was very beautiful too, and even now it has left its impression on me. Who would you say is nearer to your ideal girl when comparing Lee Da Ji (Lee Yeon Hee’s character) and Jin Young (Yoo Hana’s character)? Changmin: *laugh* Well, I like girls who I can talk about anything to comfortably, like a best friend. In regard to Dong oJo, the character I was playing, Lee Da Ji was the existence that was closest to him so maybe I should choose the character Lee Yeon Hee acted Lee Da Ji to answer this question *laugh*. On March 26, TVXQ performed ‘Before U Go’, their hit song of their newly repackaged album on MBC ‘Show! Music Core’. On that day, TVXQ showed off their powerful dancing and special charisma through the fast beats and strong rhythms of the song. Incorporating a traditional R&B song style with the deeply hidden feelings of a boy, it elevated the overall effect of the performance. [TRANS] 110328 TOHOSHINKI IN VOGUE JAPAN! Tohoshinki has been pretty successful these days, what with their repackaged album receiving many awards in Korea and their 16 minute MV of ‘Before U Go’ delightfully surprising their fans. 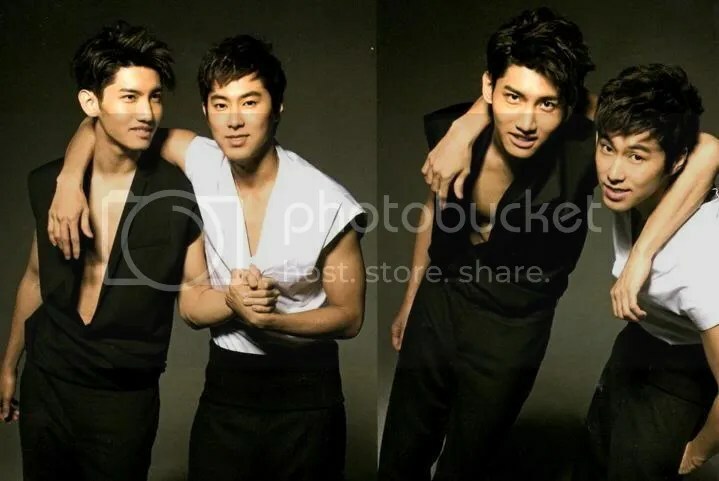 If Changmin and Yunho’s brotherly love isn’t enough (we know it definitely isn’t for you guys), this recently released photo should please everyone. In order to convey the concept of ‘Return of the King’, gone are the refined makeup and extravagant clothing. A simple and minimalistic film shoot took over, which perhaps that would generate even better reactions from everyone as the two’s individualist personalities and charisma is clearly expressed. This edition of Vogue Japan will be released in May. Partial scan – creative concept – Tohoshinki’s flash of handsome.